This is a great all around activity that C really enjoyed!!! 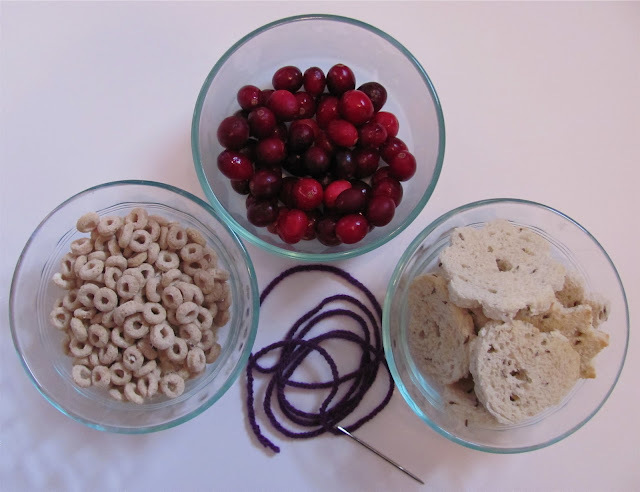 We created A Bird Feeder Garland using bread, cranberries, and oat cereal! The great thing is that this activity goes along with a wonderful book that I just discovered recently! Keep reading to find out what the book is and be sure to check it out at your local library!!! It is a perfect after Christmas read! 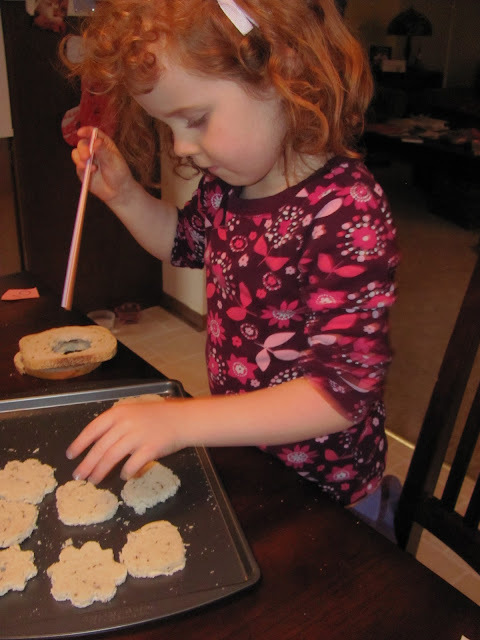 First, to prepare the bread in a fun way, we cut out shapes with cookie cutters! Then , we used a straw to create a hole in the middle of each bread shape so they would be easy to place on a needle and string. I also put the bread in a 250 oven to toast the bread a little so it wouldn't tear while stringing. You could also let the bread dry out too! After the bread was prepared, I put it in a bowl along with the cereal, and cranberries. Also, use frozen cranberries because they are easier to string with less mess! We used a tapestry needle for stringing and yarn for our string. C took a little warming up to begin this activity, but once she got started she kept going! She kept saying look how long her garland was....very proud indeed! You could work with patterning and measuring for this activity. Here are our finished garlands ready for hanging on a tree or bush outside. Just happened to finally snow and I'm sure birds and animals will be happy for this wintery treat! I also used our popcorn garland from our Christmas tree to go along with our Bird Feeder Garland! 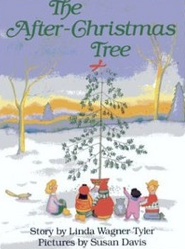 The perfect book to go along with this activity is The After-Christmas Tree by Linda Wagner Tyler. I accidentally checked this book out for Christmas and was pleasantly surprised!!! It is about a family that is saddened by the ending of Christmas and they have a Winter Party and create decorations to feed the animals for their discarded Christmas tree outside! C loved this book and keeps asking me if we are going to have a Winter Party? 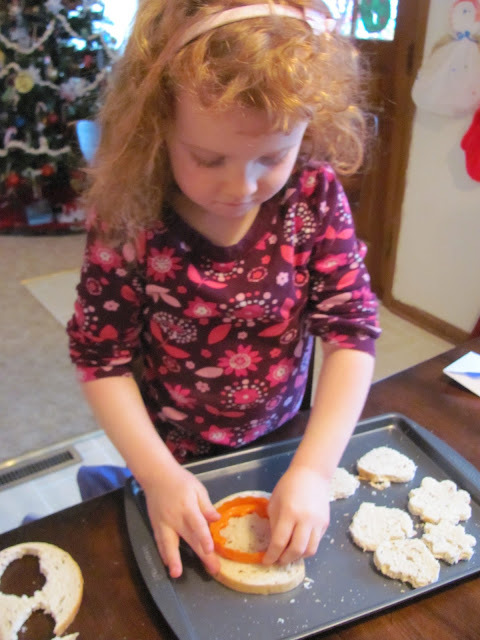 This activity might just become a tradition that we do after the holiday season! What are your After Christmas Traditions? This is such a great idea! We made one with just cranberries and our picky birds wouldn't eat them. The cut-out bread shapes make it awesome! Great suggestion to toast/dry the bread a bit. I *love* "The After-Christmas Tree!" Another similar story is Eve Bunting's "Night Tree," but it takes place on Christmas Eve. My momma and i just did the same thing! Now Pebbles (our cat) Sits at the window waiting for the birds to land on the tree. It's a great tradition I've partaken in since I can remember. This is so nice, really lovely. I have made chains of oat cereal, with my chidren,but haven't used cranberries. The toasted bread shapes are a wonderful idea. I think caring for the birds is a good teaching for young children, and one that my children always respond to. This book looks good, and I plan to look for it. thanks for this lovely post, today! I love love love this idea and think it could make a wonderful tradition. Your garland is just gorgeous! I loved this idea, but I have to be honest - my short-attention-span five year old got really bored after about 2 minutes, and my 2 year old kept eating the bread cutouts and the cheerios, by the fistful. I ended up doing it myself while they watched! But they both really enjoyed stringing them on the hedge outside, so I suppose, some days, that is as successful as you'd expect a home craft to be. Love this! Your garland is adorable!! We made some birdseed ornaments to hang outside on the first day of winter this year, after we read Eve Bunting's Night Tree. Can't wait to read your book suggestion, maybe we'll just have to make a garland too! is good that they enjoyed hanging them though! What fun!!! this looks like something we would enjoy making. I bet our chickens would enjoy them!! This and to be able to fly are the reasons to wish beeing a bird ! Awesome post, thanks a lot. Measure across the top of the cage the length you cut your dowel and hang the other hanger at that point, on the same level.